This time it was different. I didn't have to knit these gifts, they were just little extras that I could do while watching movies with my family. I didn't wait until Christmas Eve to start one. They weren't stressful at all. As with the last Autumn hats I made for Christmas, these used up some of those odd skeins of Wool- Ease I had around the house and were a chill knit. In case you don't recognize the pattern, it's Autumn, by Jane Richmond and Wool-Ease Thick and Quick was used for the sample. Personally, I like Wool- Ease for a basic hat. I don't feel a bit bad about abusing it. I can sweat in it by the end of a run, get grass and crumbled leaves all in it when rolling around on the ground (as can happen), and it will wash up fine. 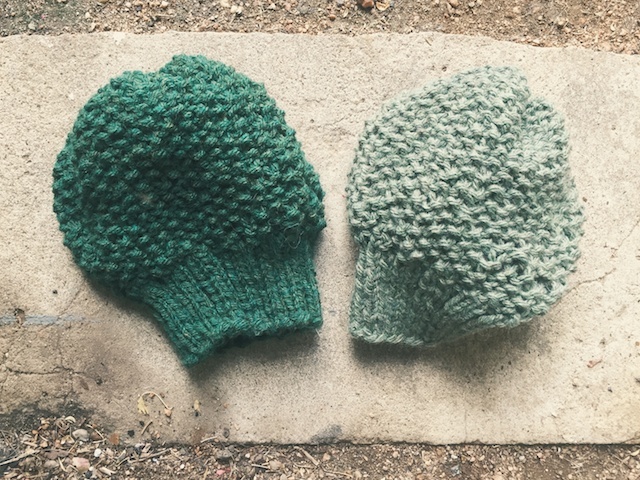 So these were made from skeins of Evergreen Heather and Heather Green in Wool-Ease Chunky. I mentioned that I was using Chunky for my hats, rather than super bulky, because that's what I had. I just knit them a bit looser and I don't really see a difference. I used size 4 needles for the ribbing and size 6s for the body. I knit the body of each just a few rows longer than the pattern directed, for extra slouchiness. This gave me only got one hat from each. The gift knitting is over! The hat knitting is not. I have one more I want to knit, for myself, but I may wait for the next Holla Knits knit-along. Congrats on finishing your gift knitting, and happy holidays! Congratulations for avoiding stressful knitting. I'll want to see that new hat! I just finished (last night) the last of my gift knitting. What a wonderful feeling. I too knit a few easy, quick hats for gifts. Its a great way to give knitted gifts without all the stress. These look great, wool-ease is a great, go to, inexpensive yarn for such projects. I've used it many times. Happy Holidays! Thank you so much!! I hope your Christmas was lovely and that your New Year is extra blessed! Merry Christmas, Cherry!! I think hats are the way to go when it comes to gift knitting. They're quick, relatively expensive, and very portable!